This appeared in Publishers’ Weekly. It’s a spot illustration from Finnegan and Fox: The Ten-Foot Cop. Tony is one of the street vendors Finnegan sees on his beat every day. Long ago when I lived in New York City I worked with a designer whose husband was in the food business. His name is Tony, too. He started his career with a lunch wagon and visited construction sites every day at lunchtime. All those construction guys came to Tony for sandwiches, chips, desserts, sodas and coffee. He worked hard and was successful enough that he eventually owned a fleet of lunch wagons. Tony kept working hard and after a little while more he was able to trade them in for his own restaurant. Isn’t that a great story? Prancing Dancing Lily is an app! Thanks to the creative people at Fat Red Couch, Inc.
Here’s a link to the scene where Lily, the cow who loves to dance, reaches New York City. She’s standing outside Radio City Music Hall where the Rockettes are holding auditions. Of course she’s surrounded by people—it is New York City, after all. Among the crowd are my niece, my sister, my wife and me! It’s not easy drawing crowds. There are so many characters to design. I like to use people I know whenever I can. Below is a photo of the 4 of us during a whirlwind weekend in New York. We’re aboard the Staten Island Ferry. 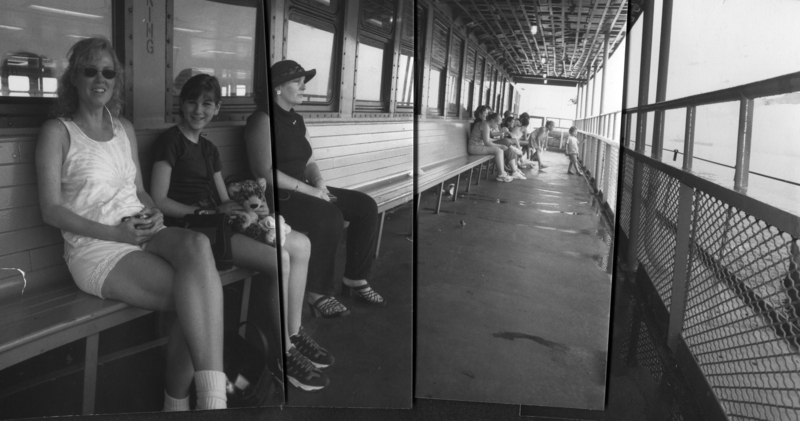 I took this series of photos with an old-fashioned film camera and pieced them together to form a complete image. It was August, 2001. Right here! Thanks to Nicole and all the creative folks at Fat Red Couch! Update! Duh, I guess I should link to where you can get the app. You kids with your iPoods will know what all this stuff means. Yes of course I paint this fast! I did a couple of presentations at Neverending Stories Bookstore in Franklin, Pa on Saturday. My friend Kyla filmed one of them. In case you weren’t there, now you can enjoy watching me paint Finnegan the New York City police horse. Here’s more from Finnegan and Fox: The Ten-Foot Cop! This scene shows New York’s Finest organizing a search for a lost little girl. My cousin’s son is a NYC cop, so naturally I had to put him in this picture or be kicked out of the family. You can see him at the bottom of the page. And here is a photo that includes his loving parents. As always: thumbnail sketch, tight pencil sketch, work-in-progress and final painting. Sorry the final looks so washed out. It looks much better in the book! You young kids already know about Etsy, but for the benefit of oldsters like me—it’s an online store where you can shop for handmade items directly from the artists. I set up my page here. Please swing by and take a look. All the art is original. If there’s an image from one of my books you’d like to see up there, give me a holler. Sorry for the delay in posting this. 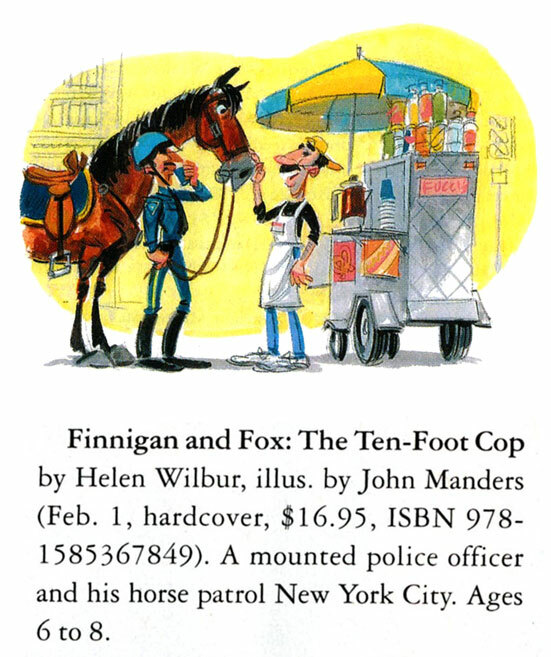 Finnegan and Fox: The Ten-Foot Cop is officially on the bookstore shelves, and we’re celebrating by taking a look at the jacket art—step-by-step. Regular readers will recognize the small, very rough thumbnail sketches. Once a thumbnail sketch is approved, I draw a tight sketch, usually at half-size of the finished painting. After approval for that comes a color sketch, and finally the finished painting. Notice how things in the foreground, close to us, are painted with vivid contrasty colors while the this in the background, farther away, are painting in light, pastel colors.